The infamous no-call is crossing into basketball territory now, as LSU basketball coach Will Wade used it as a teaching point with his team on Monday (Jan. 21). But, his point — as Voice of the Tigers Chris Blair said — is an unpopular one within the state of Louisiana. I see what Coach Wade is doing using this as a teaching tool and agree with it, BUT he is getting torn up pretty bad in the comments section. "Will Wade, go back where you belong". "Stay in your lane, Will". "his clueless comment is just FACTUALLY INCORRECT." "Keep smoking it Will. The analogy actually does a disservice to the actual Saints event"
"Did he even watch the game?" "Well Mr Wade certainly knows a lot more about losing than the Saints"
Among the 182+ other comments on the article. I bet ole Ree is pissed that upperdecker stole his thread. He had to come up with something quick. what the hell are you dreaming of now? This is such a cold take. He is saying what any coach of any kind would/should say. Using it as a teaching tool that every play matters. Coach speak. H eknows the no call was wrong and the significane. It would be nice if games played out like Wade declared but usually the othe rteam is talented and also makes plays. Sometimes gamesdo come down to one play all else being equal, If that one play is tainted by an official's call then it can be claimed the call caused defeat. 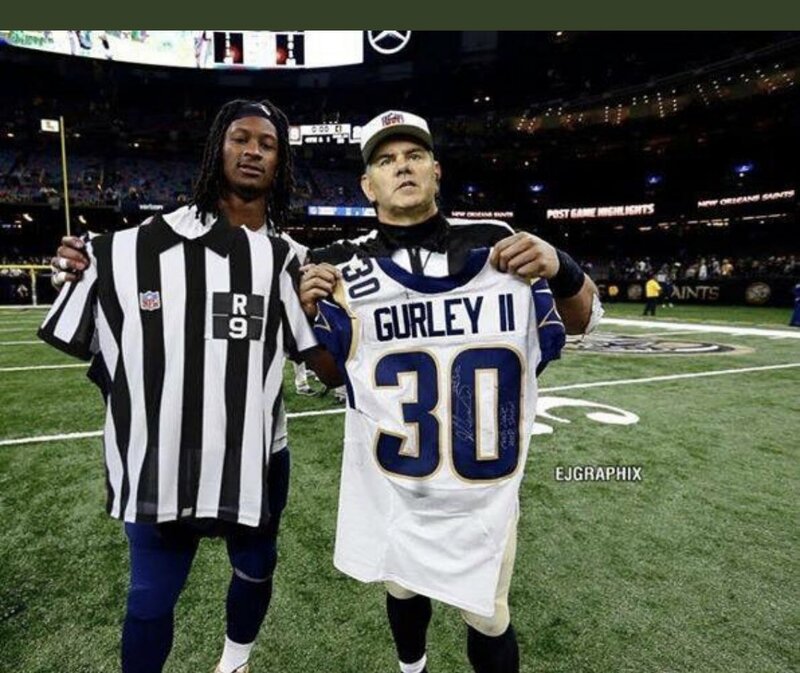 While nothing is certain at worst you can say the no call brought the game from virtually certain Saints win to enhanced opportunity for the Rams to tie or win it. Ok Will, no problem. I like your point. If LSU gets hosed by bad officiating at any point in your coaching career, I will be sure to give you no slack and lay the entire blame for the loss at your feet. I expect you to do the same and never complain about officiating. Threads like these highlight who the noncompetitive betas are. Wade is 100% correct. It was the wrong call, and Wade acknowledged that. Every time you put the game in the hands of the refs, you are taking a chance you get royally screwed over. There are numerous things the Saints could have done to prevent that call from ever making a difference in the game. Hell, even Saints players said as much. He’s not wrong and it’s pretty awesome he’s showing the team that there’s a difference between actually winning and deserving to win. The saints had plenty of chances to win, especially up 13-0. Yes we got screwed but there were a lot of things that could’ve offset that horrible no call. Eta- you’re a fricking moron and if O did this you’d be slobbing his knob. First off - Will Wade is EXACTLY correct. I said it when they didn’t get any TDs on those first 2 drives. It was a duh response / teaching moment from him. Secondly, Sean Payton is was wrong for passing twice on those downs near the goal line. He could have burned 40-50 seconds of the 1:49 remaining and forced the Rams to use their TO had they ran the ball. None of the pictures you provided have anything to do with Will Wade and if you think you’re going to get people on here to talk negatively about him, you are wrong. Only those that are CheeriOs or paid to do so like yourself, try to tear a man down to raise up someone that is less or insecure. Go bring your shite show somewhere else clown. FYI Posters - there’s your proof that O hates anyone more successful than he is and that most definitely includes Will Wade. This propaganda machine WORKS for O and is stirring shite in a negative way about an LSU coach who has an outstanding winning percentage and success rate everywhere he has been. One who has NEVER had a losing season. Did you not see the comment I made in the OP? Quit looking at my threads if they make you so upset you can't even see or read. Will is teaching the players to not expect fair, or unbiased calls. Just take matters into your own hands and a few bad calls will not affect the outcome. Look at your thread title dummy. You get so defensive when people catch on to your BS and call you out on it. Hilarious. Does your made up BS mean I'm not a pumper anymore? And miss out on idiotic responses like this one from you? NO frickING WAY a-hole!!! I guess you demented brain cells (all three or four of them) derived this from my comment stating that I agree with what Coach Wade said? frick there are some myopic people on this board. I say the sky is blue and idiots are like "just the fact that stated the sky is green shows you all you need to know". fricking morons !!! It is LSU news and everything I have posted about Eaux has not been great. If you don't like it you know you have a choice right? You seem to be pretty mental right now and overly emotional. Having a bad day? Thank God, Tiger Ree posted something I can downvote on without thinking. The thread title is from the author of the article. I didn't make it up, it was provided by NOLA.com. Should she be expecting a tweet or email from you?